Welcome to our promotion page for the latest coupons and deals from our company. Some of our coupons require a promotion code but most do not. Don’t forget to let us know which promotion you would like to take part in when you call. Our staff usually knows, but some of our promotions stack with others. This is designed to save you the most and get pest control in your home as soon as possible so we can solve your pest problem! And we love when our customers love us! 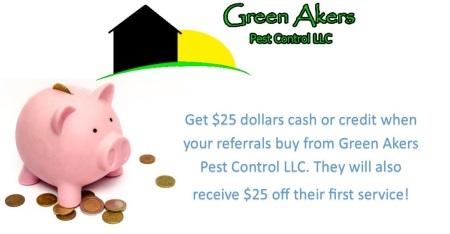 Most of our business is word of mouth and to show all of our customers how much we appreciate their referral business, Green Akers Pest Control is giving back to the consumer. It is that easy. You can use the $2 towards pest control or termite control or we’ll cut you a check. When our customers refer us to someone, we want them to know how much it means to us. If you are interested in which services we provide, please give us a call and don’t forget to tell us who referred you! 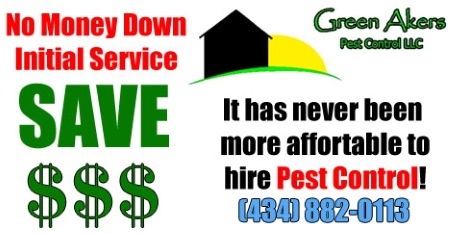 It has never been more affordable to hire pest control services. Are you having issues with spiders? Have you been having problems with ants? This promotion allows you to get exterminating services from a trained professional for FREE! When you agree to a year of pest control service, we at Green Akers Pest Control will do your initial service for free. This promotion DOES stack with the $25.00 referral plan as well. We appreciate your business, so call today and save!